*How big is your baby? 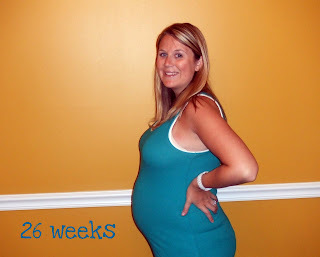 : still an eggplant...but Grayson is weighing in right around 2lbs! *Maternity clothes: all pants, shirts, AND bathing suits. *Stretch marks: None yet! I have been lathering cocoa butter on a couple times a day and then use my tummy rub at night. Seems to be doing the trick! *Sleep: I am sleeping great...making about 2 bathroom trips every single night though! Boo for that. *Best moment this week: LOTS! I got to hear my sweet boy's heartbeat, passed my glucose test--hooray!, we got the glider & love it, AND the bedding came yesterday! *Movement: He moves all day and night! I love feeling him swim around! *What I'm looking forward to: finishing his nursery...bedding pics coming soon! I just found your blog via Blue Eyed Bride. I'm due August 31 so we are pretty close in due dates. Like you, I am craving anything cold! You look great!